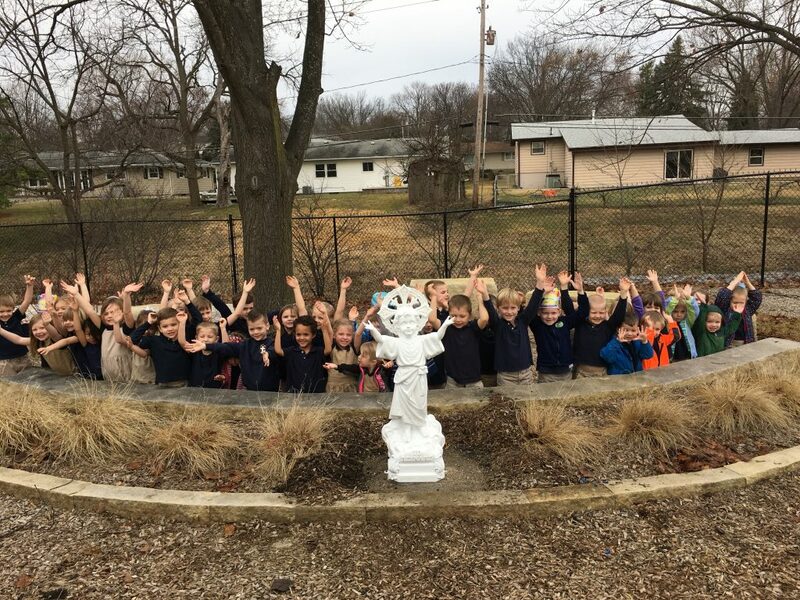 Epiphany Catholic School located in Normal, Illinois is comprised of the Kathryn Marie Albee Early Learning Center (KMAELC) and the elementary school, housing students from kindergarten to 8th grade. Our campus is extensive but at its center is Epiphany Catholic Church. 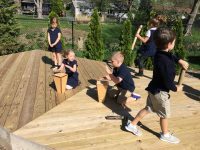 Our faith is at the forefront of all of our endeavors and we are thrilled to add our Outdoor Classroom to our beautiful campus. 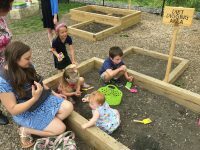 A dream of an Outdoor Classroom began 8 years ago when our church went through a renovation and the KMAELC was constructed. Since then the dream changed its site location, size, and key areas. In the fall of 2014 we had Nature Explore Classroom Designers come to our site and draft a plan for our Outdoor Classroom. As we assembled our team to begin construction, we were met with large amounts of rain during the summer of 2015. Sugar Creek runs along the west side of our property, which is located along the one side of our Outdoor Classroom site. The rain caused our land to erode and presented a problem; how do we address the drainage throughout our site? We worked closely with our landscape architect and construction company to develop a plan which we then had Nature Explore approve. This plan stems from our original design provided by the Nature Explore Classroom Designers. Our landscaping and construction crews corrected the drainage problems and built in retention walls throughout the space so any amount of rain should no longer affect the Outdoor Classroom. 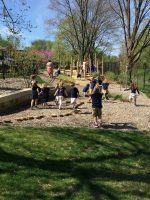 Construction for our Outdoor Classroom began in the spring of 2016. 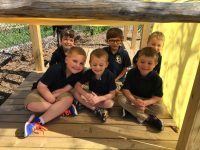 Various fundraising efforts and donations from generous school families and parishioners made our Outdoor Classroom possible. Families, preschool-8th grade, shared in our anticipation and excitement to make this space possible. Our entry features a large wrought-iron gate that displays “Enter Through the Narrow Gate” from Matthew 7:13. The gates open to a statue of Jesus as a child with His arms stretched open and upwards. We are instantly reminded of our faith and how we are meant to guide our students in every way possible; even when we are outside. 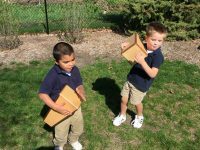 Our Outdoor Classroom houses these areas: gathering, building, nature art, climbing, messy materials, music and movement, garden, and dirt-digging. 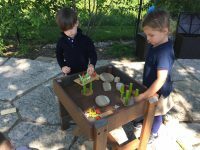 Each area has items we constructed on our own and/or items from Nature Explore. We have limestone patios, EWF pathways, grassy areas, and several plants/bushes. Our students are able to travel through areas with ease and encouraged to explore freely throughout the entire space. Classes, preschool-3rd grade, began utilizing the space starting in spring 2017. 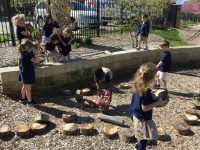 Classes explore and experience all our Outdoor Classroom has to offer during the school day. 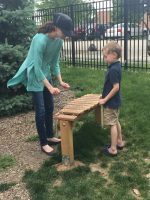 We have created a “yes” environment that allows the students to use their imagination and creativity independently as well as collaboratively. 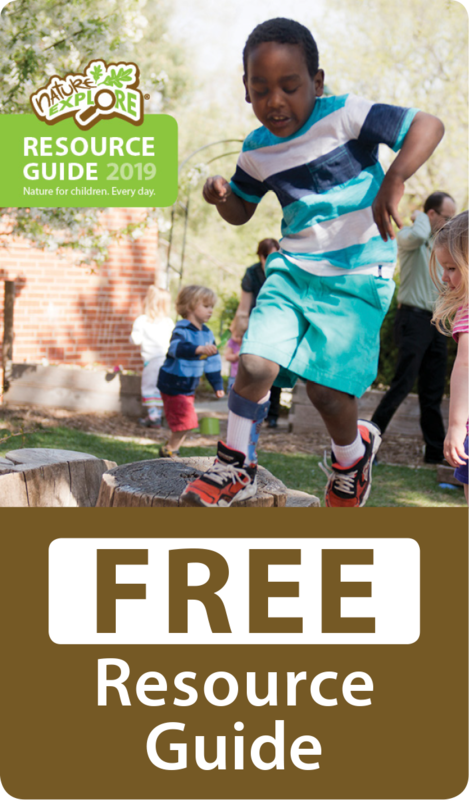 Students are encouraged to get a little dirty, inspect bugs, and wonder all while learning how to respect all that nature has to offer.